Our Lady is entrusting them with precise statements about various topics in the church as well as about other issues. A testimony of faith and peace in Medjugorje 1.16.2014. A writer from Rijeka, Diana Rosandic, witnessed for radio station Mir Medjugorje about her journey of discovery faith and peace in Medjugorje. Diana was born in the family that lived without the Lord and it was one extraordinary event in her childhood, after which she received the sacraments, got to know about God, but her true faith and peace she discovered only in Medjugorje. “I remember that in my family, we did not go to Sunday Holy Masses, nor did we said grace before the meal. Christmas was celebrated only because of family unions. I was very happy after I received all of the sacraments, after which a period of searching for God began in my life. It was then I met one wonderful man that I married later on. He was an artist and writer. At that time he was working on his second novel, where he actually wrote about Medjugorje but in codes. He got sick and we decided to come to Medjugorje in 1995. That was my first encounter with this place when I came with my sick husband”, said Diana and added how she described her experience of Medjugorje in one of her novels. “My husband was not able to climb Apparition Hill. He died afterwards, and that is what brought a wound of Medjugorje to me. I knelt here, prayed and begged for healing and that did not take place. That was my will, but God obviously had some other plans. I was not able to accept that and therefore, I refused to accept Medjugorje for many years. My friends invited me to come and join them for the Youth Festival. I was not willing to do that, but after the initial refusal I came here and this is where a new discovery took place for me. It was wonderful, full of young people. This is where my wound was healed, the wound that I got on my first trip here. I said later on that I need to continue coming to the Youth Festival in the future. Statistics for December, 2013. Number of Holy Communions: 73 000. Number of priests that concelebrated at Holy Masses: 1134 (36 per day). In the previous 2013 there have been 1 876 800 Holy Communions given in the church, and total of 38 655 priests that concelebrated at Holy Masses. Peace is the core message of Medjugorje. On a practical level however, the most important is the call to prayer, because it is only by our encountering God that He can give us all we need. In prayer He gives us peace, faith and the grace of conversion. Prayer is approaching God to present yourself to Him and in that way is the key to everything. Joy and peace are qualities that come together as a special Gift from God. Our Lady promises that, through prayer, you will receive a life force, a special power to live as children of God. Without joy and peace we cannot advance Our Lady’s program. She wants our help. “You are very important for my plans” she says. Divine grace means growth in the love of God just as God gives sun and rain for physical growth in holiness. It means complete life with God. “Let prayer be the Life of each of you”. Secularism has separated the world of prayer from the world of work. In church you are like angels but when you go outside nobody would know you were in church. In church we say; Lord, have mercy; outside we do not show mercy. In church we receive the heavenly bread; at home, we are materialistic. At one moment we pray; Say but the word and my soul shall be healed; shortly afterwards we injure each other verbally. Inside we pray; Hallowed by thy Name; but outside we blaspheme. By inviting us to make prayer our life, Our Lady is inviting us to surpass this false division in life. She wants us to realize that prayer is broader than mere asking. It also involves praising, blessing and glorifying the Lord by works as well as words. When we use God’s gifts to cooperate with Him our work gives Him praise. By cooperating with Our Lady’s messages, we begin to repair the injuries in the world. We have a great deal to do in our hearts to bring forth the glory of God. Our Lady requests our own personal conversion but a special duty is placed on us here to pray for those who are far from God. Here again we sense our importance in her plan; by our prayers we can effect the conversion of those “far away”. By the evidence of our conversion we can be instrumental in leading the strays back to the fold. Good example is one of our great responsibilities. It is in our behavior that people see who and what we are. In this sense our faith is not a private matter-it affects the lives of others. Jesus too prayed for those who were far away but, as the good shepherd, He went after the lost sheep. Let us pray that we may understand how we can help Our Lady in these plans. Lent consists precisely of the words that Our Lady repeated to us so many times here in Medjugorje: prayer, fasting, penance, conversion. Lent is a time of grace, because in forty days-through personal trial and purification-we have the occasion to touch the bottom and the summit of a meaningful life. What is asked from us during this time is also to renounce the joys of this world in order to become fully free, because only in freedom can our soul feel at home. During lent, it is necessary to find a moment of peace, a moment of self-denial. It is necessary to die to oneself in order to begin to live as a reflection of a light of Christ, and to shine in others. In Lent, you simply have to chose, you have to taste the bitterness of the suffering Christ if you want to rejoice in His glorification. In His trials, Jesus was praying, fasting and suffering. He knew that without the experience of suffering and without a time of personal refinement, He would not be able to transform humanity. He was utterly given to the service of men, He approached men through suffering, by His drops of sweat, and He watered the seed of friendship between man and God, and by His blood sealed forever the covenant. This is a clear example we also should follow. We have to seek Jesus in suffering and in self-denial. So, whenever you enter into suffering, illness, fear, anguish-know that this is the door to Christ. This is how your situation becomes a meeting point with God. This is why those who suffer are a blessing for the earth, the society and the nation. 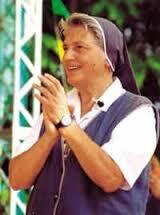 So let us follow Christ and put into practice the appeals of the Queen of Peace from Medjugorje. And let us not forget: Without Golgotha Easter cannot shine. With the beginning of every Lenten season there is also an encounter with the event of Jesus’ temptation after His forty-day stay in the desert. The basic question according to that is not how it could happen that Jesus was tempted, but rather how He resisted the temptations. What Satan was trying to tell Jesus as soon as he tempted Him was the effort to show Him that what He did in the desert was useless and worthless. Retreat into prayer and fasting is unnecessary and does no good. Of what value is it to Him when after it all, He is hungry and has nothing by which to relieve His hunger? Satan, on the contrary, offers his solution to that: glory, influence and wealth instead of His real vocation. in this capacity to suffer and at the same time offer it. To do this it is necessary to say, to cry out to God about our suffering, kneeling with our eyes fixed on the Crucifix. We must form this way of thinking so that in the moment of the Cross, we do not walk around gossiping, throwing away and wasting this precious moment in which Jesus is sharing the Cross with us and giving us a small part of His pain on the cross. Pain is a part of human life; do not cast it out, make it trivial or talk about it in such a way! This is my experience as a weak and fragile woman and I know that many times I, too, lost those moments. When I reflected and saw the picture of how often this happened, I said to myself, “Look at what I lost. How immature I was!” we have a saying of three words to see us through the moments of suffering and provocation. “Silence, swallow and suffer”. When someone comes and reprimands you and you defend yourself, the other young men and woman say: “You’ve missed the train, the train of maturity, of self-control, of the capacity to be quiet and to suffer with dignity in silence.” I teach these things to the young people because when they leave the community, their boss at work will want to be right, their spouse will want to be right, the children will argue and someone for sure must give in for peace to reign. Yes, peace is most important and to know how to “give in” is our safeguard. It is the mysterious school of the Cross, of God Who did not explain it but welcomed it, going through it with the body of His crucified Son. Jesus invites us to look at Him, to ask Him for faith and love because our eyes will not lose hope, because behind the darkness of Good Friday we know how to capture the shining light of Easter Morning. The Risen Jesus is our true hope because in Him pain and death are defeated. This is the experience in the Community that we physically touch everyday. We see life bloom again in the faces that were once marked by the desperation of the street, which begin to shine in the light of the Risen One. Thank you Jesus for your love. Thank you Jesus for your pain. NEW WEBSITE!!! Thanks to one of our very gifted Board members, Jeff Pettit, we have a new, amazing website. www.centerforpeacewest.com Check it out and let us know your thoughts and suggestions. Last month, many of you received multiple copies of the newsletter. We had printing problems that I hope are now cleared up. I hope you shared the “good news” and passed your extra copies to others! The current newsletter is a combination of Feb. and March. The next edition will be sent out the end of April.